Adam Sorokin, .049, 5.87, 218.80 mph def. Dusty Green, .098, 5.96, 208.36. Tony Bartone, .113, 5.84, 240.77 def. Ron August, Jr., .117, 6.56, 169.34. Jim Murphy, .086, 5.77, 243.55 def. Rick Williamson, .135, 5.99, 237.59. Bill Dunlap, .190, 5.80, 245.90 bye. Bill Dunlap, .118, 5.79 seconds, 250.97 def. Adam Sorokin, .059, 6.27, 203.86. Tony Bartone, .089, 13.22, 65.76 def. Jim Murphy, -.039 red light, 5.79, 241.20. Tony Bartone, Long Island City, NY, .109, 5.66*, 255.34 mph def. Bill Dunlap, Capitola, Calif., .187, 5.74, 245.05. Richard Townsend, .189, 6.07, 233.92 bye (opponent broken). Kris Krabill, .171, 5.93, 235.35 bye (opponent broke). Robert Overholser, .183, 5.93, 243.46 def. Brad Thompson, .092, 9.63, 93.18. Steven Densham, .130, 6.600, 208.30 def. Marc Meadors, DQ-crossed centerline at 400′. Kris Krabill, .232, 5.92, 237.96 def. Richard Townsend, -.344 red light, 13.77, 67.48. Robert Overholser, .109, 5.909, 243.02 def. Steven Densham, .112, 6.03, 232.39. Kris Krabill, Kent, Wash., .094, 8.38, 101.55 def. Robert Overholser, Clovis, Calif., -.238 redlight, 6.11, 246.84. Jeremy Sullivan, .186, 8.49, 93.23 (automatically advanced against Matt Moreira, Boise, .082, 6.41, 188.41. Dan Hix, .162, 6.52, 158.30 def. Shawn Callen, .197, 7.19, 201.07. Jeremy Sullivan, Lake Mathews, Calif., .198, 6.37, 188.65 def. Dan Hix, Central Point, Ore., .093, 6.48, 158.76. Garrett Richards, .060, 6.202, 213.43 def. Rod Burbage, .066, 8.077, 130.57. Dustin Hentges, Olympia, Wash., .014, 7.51 (7.47 dial), 171.95 def. Allen Macham, Everett, Wash., .023, 9.24 (9.21 dial), 147.44. Semi: Elden Lacer, Las Vegas, Nev.; Shawn Hart, Layton, Utah. Quarter: Tom Clark, Spokane, Wash.; Andy Morris, Olympia, Wash.; Thomas Bayer, Alta Loma, Calif.
Eighth: Steve Lambert, Boise; Jeffrey Shumway, N. Las Vegas, Nev.; Steve Reynolds, Nampa; Paul Eddins, Rexburg; Krista Suydam, Bakersfield, Calif.; Bob Mueller, Grand Junction, Colo.; Gordon Turner, W. Valley City, Utah. Dustin Ward, Renton, Wash., .047, 10.86 (10.78 dial), 106.97 def. Wendy Parsons, Monroe, Utah, .017, 10.51 (10.54 dial), 123.00. Semi: Brad Burton, Snohomish, Wash.; Brent Borchers, Meridian. Quarter: Phil Sielaff, Pine; Mark Kidd, Twin Falls; Larry Hale, Buhl; Jeffrey Langan, Boise. Glen Phillips, Middleton, .037, 12.50 (12.43 dial), 104.63 def. Brad Todd, Meridian, .181, 11.76 (11.80 dial), 109.80. Quarter: Christopher Wingert, Boise; Paul Sanders, Phoenix, Ariz.
David Kletzien, Boise, .202, 9.48 (9.44 dial), 144.43 def. Deb Bittick, Emmett, .112, 10.48 (10.62 dial), 119.91. Quarter: Chase Bittick, Middleton; Brad Crawford, Kennewick, Wash.; Isaac Biebuyck, Nampa. Dan Lafferty, Wendell, .010, 7.19 (7.18 dial), 185.38 def. Jon Bradford, Tucson, Ariz., .013, 6.16 (6.22 dial), 219.97. Jon Bradford, Tucson, Ariz., .030, 6.24 (6.24 dial) 223.73 def. Tom Clark, Spokane, Wash., .014, 7.23 (7.18 dial) 186.33. 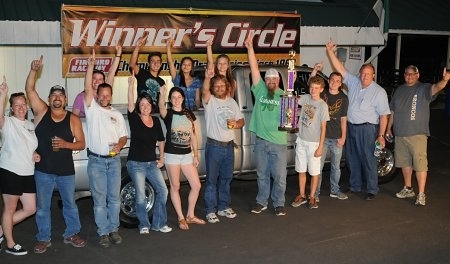 Semi: J.R. Leerkamp, Olympia, Wash.
Quarter: Jim Tattersall, Eden: Mark Sievers, Grand Junction, Colo.; Cody Hiatt, Boise. Dan Lafferty, Wendell, .022, 7.28 (7.26 dial) 176.03 def. Steve Lambert, Boise, .016, 8.09 (8.01 dial) 160.96. Semi: Darryn O’Connor, Fort St. John, B.C. Quarter: Bud Preuss, Grand Junction, Colo.; Jason Covington, Grand Junction, Colo.; Mark Kidd, Twin Falls. Chad Axford, North Las Vegas, Nev., .015, 8.32 (8.30 dial), 157.89 def. Chuck Hawk, Sr., .020, 7.82 (7.80 dial), 168.49. Semi: Rayce Kidd, Twin Falls; Dale Green, Pacific, Wash.
Quarter: Mark Sievers, Grand Junction, Colo.; Janice Myhre, Sheridan, Calif.; Sam Northup, Boise; Nick Nicholson, Vancouver, Wash.
David Deming, Nampa, .006, 10.40 (10.41 dial), 119.65 def. Chad Campbell, Meridian, .009, 10.05 (10.08 dial), 130.67. Semi: Brandon Umberger, Grand Junction, Colo.; Jason Thomas, Meridian. Quarter: Burdette Hoelzle, Boise; John Johnson, Caldwell; Levi Burlile, Nampa; Ron Kissner, Grand Junction, Colo.
Quickest Door Car – Jake Neibauer, Billings, Mont., `63 Corvette, 7.07 seconds. Quickest Roadster – Reg DeForest, Edmonton, Alta., `23 Roadster, 6.85 seconds. Quickest Bike/Sled – Dave Allen, Meridian, `08 Hayabusa, 8.25 seconds. Mark Kidd, Twin Falls, .019, 7.52 (7.55 dial), 165.78 def. Andy Morris, Olympia, Wash., .015, 7.60 (7.65 dial), 174.37. Semi: Tom Malicki, Brush Prairie, Wash.; Jesse Adams, Yuba City, Calif.
Quarter: Justin Cooper, Medical Lake, Wash.; Gregory Garrison, Flagstaff, Ariz.; Ed Franek, Payette; Kelly Bailey, Grand Junction, Colo.
Eighth: Dale Green, Pacific, Wash.; Elden Lacer, Las Vegas, Nev.; Darrell Carr, Fruitland; Jim Tattersall, Eden; Garrett Quinlan, Nampa; Brad Pattan, Emmett; Trent Stevens, Roy, Utah. Scott Parsons, Monroe, Utah, .016, 9.40 (9.42 dial), 136.70 def. Jeff Taylor, Forest Grove, Ore., .019, 9.10 (9.13 dial), 149.25. Quarter: Steve Kelly, Camas, Wash.; Matt Kielman, Vancouver, Wash.
Jerry Trolard, Vale, Ore., .055, 12.08 (12.08 dial), 110.18 def. Paul Sanders, Phoenix, Ariz., .051, 13.45 (13.48 dial), 96.98. Quarter: Lucas Hull, Middleton; Kristi Shawver, Meridian; Travis Bowins, Meridian. Ashton Davis, Middleton, .083, 12.36 (12.34 dial), 99.14 def. Liz Micheletty, Kuna, Idaho, .139, 9.89 (9.90 dial), 140.97. Semi: Cheyanne Price, W. Jordan, Utah. Quarter: Scott Grondahl, Nampa; David Wood, Eagle: Alex Smith, Kuna. Chris Jaggers, Middleton, .013, 7.94 (7.95 dial), 168.43 def. Gordon Turner, West Valley City, Utah, foul. Semi: Ryan Cook, Idaho Falls; Buzz Nielsen, Rexburg. Troy Pecht, Caldwell, .013, 10.19 (10.15 dial), 129.22 def. Mick Alley, Eagle, .059, 10.08 (10.10 dial), 128.19. Semi: Larry Pittenger, Williams, Ariz.; Les Migneault, Meridian. Trevor Harkema, Hayden, Idaho, .021, 7.75 (7.76 dial), 168.43 def. Diana Anderson, Twin Falls, Idaho, .015, 9.28 (9.30 dial), 159.02. Semi: Rick Northup, Boise; Matt Compton, Boise. Quarter: Krista Suydam, Bakersfield, Cali. ; Janice Myhre, Sheridan, Calif.; Ron Kissner, Grand Junction, Colo.; Jim Cox, Weiser. Jeffrey Langan, Boise, Idaho, .047, 11.55 (11.55 dial), 114.11 def. Dustin Ward, Renton, Wash., .067, 10.81 (10.82 dial), 118.62. Semi: Jason Thomas, Meridian; Steve Wingert, Boise. Quarter: Kyle Witherspoon, Boise; Tim Shawver, Meridian; Andy Bell, Boise; Chad Campbell, Meridian. Mark Kidd, Twin Falls, .021, 7.64 (7.61 dial), 166.95 def. Tom Malicki, Brush Prairie, Wash., -.002, foul, 7.58 (7.53 dial) 163.97. Semi: Bob Mueller, Grand Junction, Colo.; Jesse Adams, Yuba City, Calif.
Quarter: Steve Lambert, Boise; Gordon Boven, Boise; Mark Barnhart, Emmett; Russ Stryker, Truxton, Ariz.
Eighth: Ed Franek, Payette; Larry Saunders, Fruitland; Tom Clark, Spokane, Wash.; Chris Jaggers, Middleton; Jim Tattersall, Eden; Kevin Rennick, Kent, Wash.; Mark Sievers, Grand Junction, Colo.
Joe Witherspoon, Caldwell, .062, 11.10 (11.08 dial), 119.33 def. Karl Martin, Riverton, Utah, .059, 11.60 (11.61 dial), 109.62. Semi: Darin Bussert, Boise; David Chun Jr.; Vancouver, Wash.
Quarter: Mark Kidd, Twin Falls; Larry Hale, Buhl; Jeff Taylor, Forest Grove, Ore.; Larry Pittenger, Williams, Ariz..
Ron Wurtz, Caldwell, .045, 12.22 (12.20 dial), 107.30 def. Chris Wingert, Boise, .033, 11.93 (11.90 dial), 110.60. Quarter: Duston Wurtz, Nampa, Casey Compton, Boise. Chad Hofert, Meridian, .138, 8.90 (8.90 dial), 151.34 def. 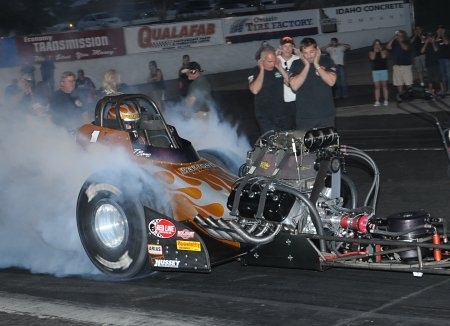 Brad Crawford, Kennewick, Wash., .082, 9.68 (9.69 dial), 138.00. Quarter: Alex Smith, Kuna; David Wood, Eagle; Zak Pedraza, Boise. Greg Hicks, Las Vegas, .021, 8.39 (8.39 dial), 157.48 def. Garrett Quinlan, Nampa, .023, 8.61 (8.61 dial), 176.01. Semi: Trevor Harkema, Hayden; Jerry Dean, Olathe, Kan.
Quarter: Tom Elliott, Richland, Wash.; Darrell Carr, Fruitland; Bob Seamons, Ogden, Utah; Mike Nicholson, Vancouver, Wash.
Matt Kielman, Vancouver, Wash., .031, 10.95 (10.92 dial), 117.18 def. Brent Borchers, Meridian, .112, 10.89 (10.85 dial), 116.20. Semi: Scott Parsons, Monroe, Utah; Phil Sielaff, Pine. Quarter: Richard Lally, Boise; Steve Wingert, Boise; Garrett Parsons, Monroe, Utah; Justin Cooper, Medical Lake, Wash.
7. Jim Tattersall, Eden, 7.30, 186.48. Krista Suydam, Bakersfield, Calif., .005, 7.68 (7.67 dial) 175.39 def. Tim Wallace Jr., Meridian, .049, 6.83 (6.82 dial) 199.82. Semi: Jesse Adams, Yuba City, Calif.; Kacee Bootsma-Morris, Olympia, Wash.
Quarter: Gordon Boven, Boise; Jack Beckman, Norco, Calif.; Darryn O’Connor, Fort St. John, BC; Tom Clark, Spokane, Wash.
Eighth: Rory Eddins, Idaho Falls; Rodney Snider, Grand Junction, Colo.; Jake Neibauer, Billings, Mont. ; Jim Tattersall, Eden; Andy Morris, Olympia, Wash.; Camille Murdock, Nampa. Duston Wurtz, Nampa, .045, 14.05 (12.00 dial) 74.59 def. Carl Youngstrom, Caldwell, broke. Semi: Mick Alley, Eagle; David Deming, Nampa. Quarter: Anthony Keller, Kuna; Brad Burton, Snohomish, Wash.; Jackie Alley, Eagle; Seth McLean, Nampa. Casey Compton, Boise, .061, 13.27 (13.25 dial) 100.00 def. Mike Ritz, Boise .247, 12.48 (12.45 dial) 113.78. Quarter: Jerry Trolard, Vale, Ore.; Travis Bowins, Meridian. Dave Kletzien, Boise, .061, 9.58 (9.48 dial) 131.82 def. Alex Smith, Kuna, .113, 10.45 (10.35 dial) 124.64. Quarter: Chad Hofert, Meridian; Deb Bittick, Emmett.Cheyenne Price, W. Jordan, Utah. W: Phillip Comegys (PSI Racing) – 10.91, 123.52 (10.84 dial). R/U: Chad Campbell (PSI Racing) – broke. Semi’s: Frank Wilson (Mopar Mafia); Denise Clark (Naughty Girls). Quarter’s: Brent Borchers (Rock-It Racing); Joe Fuentes (The Hustlers); Carl Youngstrom (CY Racing). W: Luke Jacobson (Mopar Mafia) – 12.64, 105.98 (12.60 dial). R/U: Bret Ward (CY Racing) – 11.99, 111.05 (11.93 dial). Semi’s: Lucas Hull (Melba Outlaws). 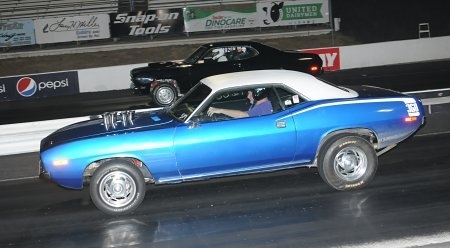 Quarter’s: Kristi Shawver (Down `n Dirty); Clyde Hughes (Mopar Mafia); Jerry Trolard (Melba Outlaws). W: Sabra Rasmussen (Melba Outlaws) – 13.02, 101.83 (12.97 dial). R/U: Perry Hammons (Down `n Dirty) – 15.67, 86.61 (15.68 dial). Semi’s: Jason Squire (Venom Racing). Quarter’s: Tyler Rush (Kuna Knuckle Draggers); Casey Compton (Not About The Money). W: Jason Shipp (Flying Brick) – 13.05, 90.70 (12.90 dial). R/U: Brayden Novotny (Melba Outlaws) – 14.34, 94.92 (14.09 dial). Semi’s: Fuzzy Sterling (Down `n Dirty); Stephanie Marsala (The Barons). Quarter’s: Sandra Albertia (Kuna Knuckle Draggers); Vince Dinh (Down `n Dirty; Josh Wallace (CY Racing); Judd Trolard (Melba Outlaws). W: James Jones (The Hustlers) – 15.14, 87.35 (15.00 dial). R/U: Mikaela Watkins (Naughty Girls) – 15.98, 88.28 (15.76 dial). Semi’s: Bryn Anderson (Venom Racing). Quarter’s: Rod Mills (The Hustlers); Jon Anderson (Venom Racing); Randy Howell (Down `n Dirty). Sean Shaffer, Boise, .011, 7.62 (7.61 dial) 178.66 def. Troy Pecht, Caldwell, .014, 9.33 (9.38 dial) 138.46. Quarters-Ed Cutler; Dave Goff; Cody Hiatt. Eighth-Seth McLean; Chris Jaggers; Sam Northup; Steve Reynolds; Shayne Schaefer; Larry Saunders. Jason Thomas, Meridian, .026, 10.57 (10.56 dial) 122.74 def. Stan Deming, Nampa, .005, 10.398 (10.38 dial) 124.97. Eighth-John Smith; Jerry Trolard; Jeffrey Langan; Denise Clark; Ken Clark. Tim Osmus, Middleton, .097, 10.37 (10.33 dial) 122.95 def. Zak Pedraza, Boise, .103, 10.02 (9.98 dial) 125.99. Luke Jacobson, Caldwell, .028, 12.63 (12.63 dial) 106.51 def. Joseph Karnes, Boise, .077, 12.86 (12.88 dial) 106.64. Quarter-Matt Barnhart; Gary Kruger; Lee Zimmerman; Patsy Lindbloom. Eighth-Bryce Fogleman; Jonathan Palmer; Rex Petersen; Marguita Palmer; Stephanie Meimann; Kristi Shawver; Maggie Watts; Todd Martell. Rion Coates, Eagle, .078, 8.29 (8.24 dial) 74.44 def. Layne Fiscus, Boise, .162, 9.23 (9.24 dial) 70.26. Quarter-Michael Jaggers; August Basile; Casey Youngstrom; Hannah VanderMeer. Dan Hurlbert, Eagle, .026, 12.17 (12.14 dial) 107.99 def. Marcia Randall, Emmett, .037, 11.50 (11.29 dial) 117.88. John Smith, Ontario, Ore., .046, 10.92 (10.91 dial) 120.64 def. Carl Youngstrom, Caldwell, .114, 10.35 (10.31 dial) 121.62. Quarter-Jeffrey Langan; Marcia Randall; T.J. Smith. Dave Allen, Meridian, .068, 8.60 (8.32 dial) 167.91 def. David Kletzien, Boise, -.083 redlight, 9.44 (9.49 dial) 144.91. Brady Jesser, Boise, .067, 11.58 (11.54 dial) 117.87 def. Gary Kruger, Nampa, .146, 12.40 (12.49 dial) 107.87. Quarter-Kristin Forrey; Tom Bittick; Cody Myers. Mason McCoy, Boise, .065, 15.87 (15.80 dial) 74.02 def. Terra Keller, Kuna, .072, 16.62 (16.69 dial) 76.06. Janice Witherspoon, Vallivue High, .068, 16.77 (15.90 dial) 61.04 def. Brandon Hillard, Borah High, .509, 29.30 (14.72 dial) 55.53. Joe Witherspoon, Caldwell, .060, 10.98 (10.96 dial) 117.27 def. Mike Ritz, Boise, .073, 12.44 (12.45 dial) 114.01. Quarter-David Meimann; Ashton Davis; Mark Baird.